Can we help sew it?!?! Now while I love my kids and want to teach them new things, trying to teach three high energy boys to sew while tired from traveling didn’t seem very high on my to-do list. Especially when I could get the dolphin sewed my myself in five minutes. All three patiently threaded a needle and made several stitches, lovingly sewing up the toy. Out of the three, Noah really enjoyed the process. A week later he continues to ask for things to sew and has picked up the little sewing kit at least once a day since we first bought it. It taught me a valuable lesson in loving my kids. Don’t forget to love them with your time. Love them enough to let them do it themselves. 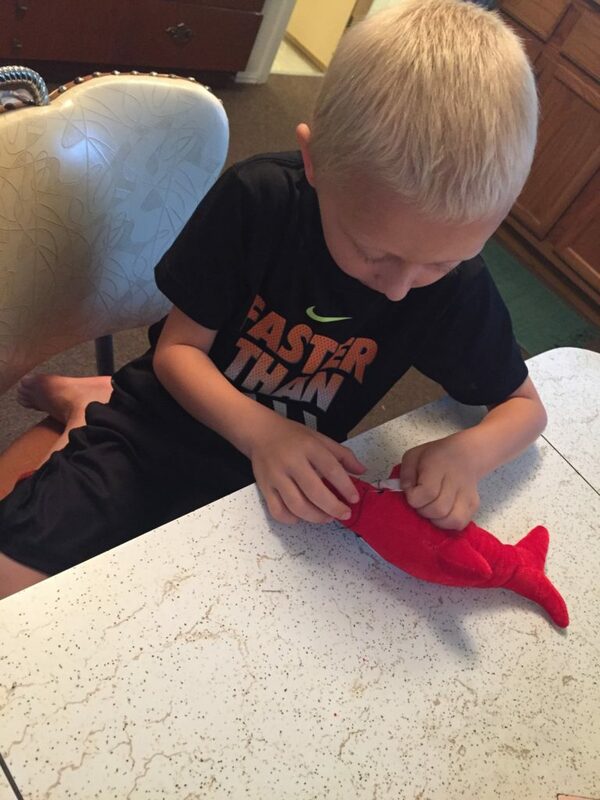 Love them by sitting for the hour and teaching them to sew the dolphin I could have sewed in five minutes. Giving them the skills to succeed in life when I’m not around. Love is such an ambiguous thing. We all give and receive love in different ways. Most of us tend to give love to others the way we like to receive love. For me, it’s always an ongoing process to remember to give love to others in ways that are meaningful to them. Today’s challenge: Choose one person in your life. Think about how they like to be loved. And then, love them.